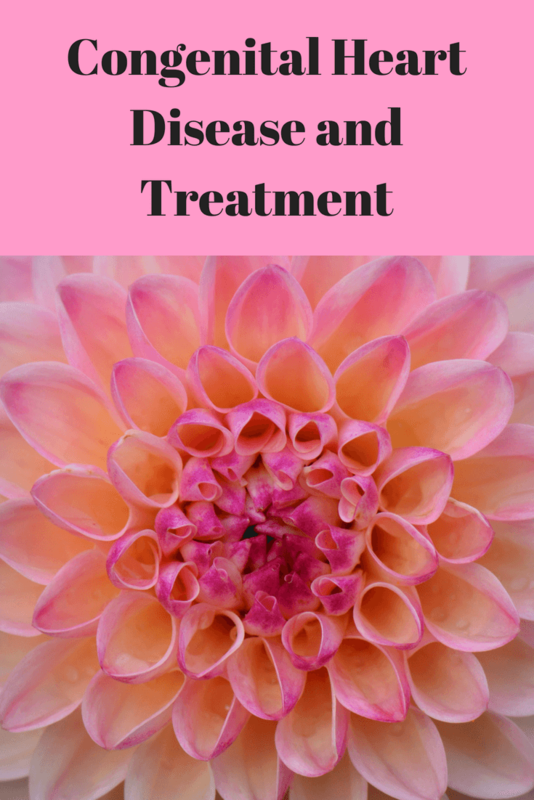 Hereditary heart disease treatment. 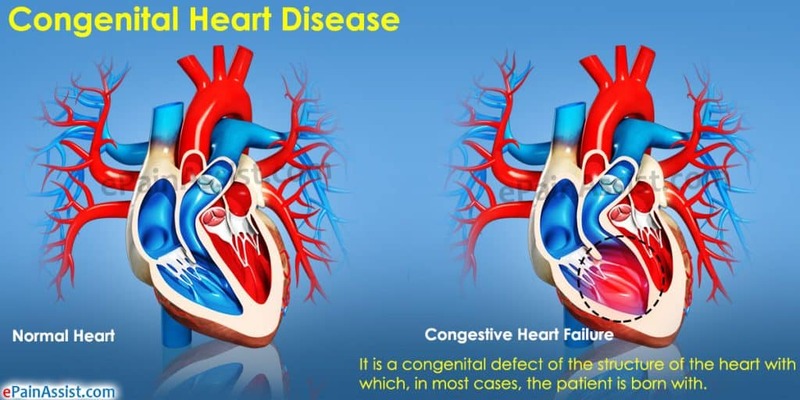 Congenital (meaning present at birth) heart disease is a term used to describe a number of different conditions that affect the heart. These heart abnormalities are problems that occur as the baby’s heart is developing during pregnancy before the baby is born. Congenital heart disease (CHD) affects 1 in 120 babies born in the United States, making heart defects the most common birth defects. Specific steps must take place in order for the heart to form correctly. Often, congenital heart disease is a result of one of these crucial steps not happening at the right time. Patent ductus arteriosus (PDA): This defect short circuits the normal pulmonary vascular system and allows blood to mix between the pulmonary artery and the aorta. Prior to birth, there is an open passageway between the two blood vessels. This opening closes soon after birth. When it does not close, some blood returns to the lungs. Patent ductus arteriosus is often seen in premature infants. Atrial septal defect (ASD): In this condition, there is an abnormal opening between the two upper chambers of the heart — the right and left atria — causing an abnormal blood flow through the heart. Ventricular septal defect (VSD): In this condition, a hole in the ventricular septum (a dividing wall between the two lower chambers of the heart — the right and left ventricles) occurs. Because of this opening, blood from the left ventricle flows back into the right ventricle, due to higher pressure in the left ventricle. This causes an extra volume of blood to be pumped into the lungs by the right ventricle, often creating congestion in the lungs. Atrioventricular canal (AVC or AV canal): AVC is a complex heart problem that involves several abnormalities of structures inside the heart, including atrial septal defect, ventricular septal defect, and improperly formed mitral and/or tricuspid valves. Tricuspid atresia: In this condition, there is no tricuspid valve, which means no blood flows from the right atrium to the right ventricle. Pulmonary atresia: This is a complicated CHD in which there is abnormal development of the pulmonary valve. Transposition of the great arteries (TGA): With this condition, the positions of the pulmonary artery and the aorta are reversed. Tetralogy of Fallot (TOF): This condition is characterized by four defects, including an abnormal opening, or ventricular septal defect; a narrowing (stenosis) at or just beneath the pulmonary valve that partially blocks the flow of blood from the right side of the heart to the lungs; a right ventricle that is more muscular than normal and often enlarged; and an aorta that lies directly over the ventricular septal defect. Double outlet right ventricle (DORV): In this condition, both the aorta and the pulmonary artery are connected to the right ventricle. Truncus arteriosus: In this condition, the aorta and pulmonary artery start as a single blood vessel, which eventually divides and becomes two separate arteries. Truncus arteriosus occurs when the single great vessel fails to separate completely, leaving a connection between the aorta and pulmonary artery. Coarctation of the aorta (CoA): In this condition, the aorta is narrowed or constricted, obstructing blood flow to the lower part of the body and increasing blood pressure above the constriction. Aortic stenosis (AS): In this condition, the aortic valve between the left ventricle and the aorta did not form properly and is narrowed, making it difficult for the heart to pump blood to the body. Hypoplastic left heart syndrome (HLHS): A combination of several abnormalities of the heart and the great blood vessels. In some cases, there will be a combination of several heart defects, making for a more complex problem that can fall into several of these categories. Most forms of congenital heart disease have no known cause. Mothers will often wonder if something they did during the pregnancy caused the heart problem. In most cases, nothing can be attributed to the heart defect. Some heart problems do occur more often in families, so there may be a genetic link to some heart conditions. Other CHDs are likely to occur if the mother had a disease while pregnant and was taking medications, such as anti-seizure medicines. However, most of the time there is no identifiable reason as to why the heart condition occurred. Many serious congenital heart diseases are detected during pregnancy, during a routine ultrasound exam. Others may be diagnosed shortly after birth. Less serious heart conditions may go undiagnosed until children are older and begin to show certain signs or symptoms of congenital heart disease. During pregnancy, if your physician believes your baby may have CHD, you will likely be referred to a pediatric cardiologist for further testing. The type of diagnostic tests performed will depend on the form of CHD your child may have. Examples of the tests used include a fetal echocardiogram, electrocardiogram (EKG), cardiac magnetic resonance imaging (MRI) and cardiac catheterization. If you are referred to The Children’s Hospital of Philadelphia, you will be seen through the Cardiac Center’s Fetal Heart Program. 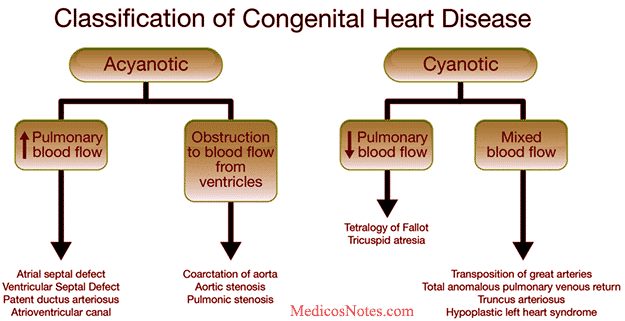 Congenital heart problems range from simple to complex. Some heart problems can be watched by your child’s cardiologist and managed with medicines, while others will require heart surgery or cardiac catheterization — sometimes as soon as in the first few hours after birth. A child may even “grow out” of some of the simpler heart problems, such as patent ductus arteriosus (PDA) or atrial septal defect (ASD). These conditions may simply resolve on their own as the child grows. Other children will have more complex forms of congenital heart disease, or a combination of different types, and require several operations or catheter interventions and ongoing care throughout their lives. Babies with congenital heart disease are followed by specialists called pediatric cardiologists. These physicians diagnose heart conditions and help manage the health of children before and after surgical repair of the heart problem. Specialists who correct heart problems in the operating room are known as pediatric cardiovascular or cardiothoracic surgeons. 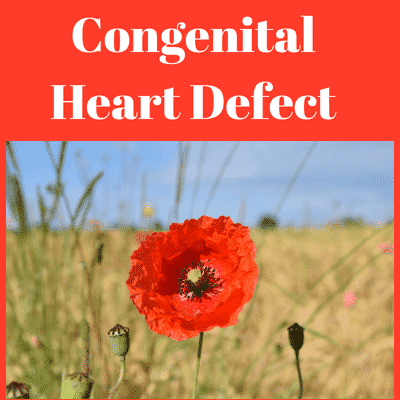 It is imperative that individuals born with congenital heart disease who have reached adulthood transition to the appropriate type of cardiac care. The type of care required is based on the type of CHD a person has. People with simple types of CHD can generally be cared for by a community adult cardiologist. The taurine is an amino acid which has excellent benefits for the heart. that I take to heal my heart naturally. A plethora of studies have been done that prove the benefit of Coq10 for the heart. Coq10 should also be taken if someone is taking a statin. is an amino acid that is part of the “awesome foursome”. Carnitine supports the mitochondria. that I take. Ribose gives me so much energy. Ribose also supports the mitochondria.